artsBASICS proudly announces an extension of its partnership with the Davenport Community Schools through the Partners in Education Program of the John F. Kennedy Center for the Performing Arts. 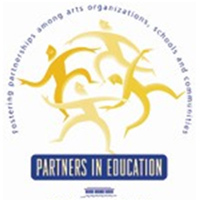 The Partners in Education program is designed to assist arts organizations throughout the nation to develop or expand educational partnerships with their local school systems. The primary purpose of these partnerships is to provide professional learning in the arts for teachers. In 1992, this program was awarded the Association of Performing Arts Presenters’ Dawson Award, which recognizes innovative and successful projects. The Partners in Education program is based on the belief that teachers’ professional learning is an essential component of any effort designed to increase the artistic literacy of young people. The Kennedy Center’s extensive experience with its local professional learning program, established in 1976, provides the basis for this national program. Currently, almost 100 Partnership Teams in near 40 states and the District of Columbia participate in the program. Each Partnership Team consists of at least two members: a representative of an arts organization and a representative of the senior administration of a neighboring school district. As part of our requirements for the partnership, we will hold a minimum of three workshops for teachers in the arts each year. They can be arts integration or arts-discipline focused workshops. Further planning will take place at our upcoming artsBASICS Strategic Planning Session.